As you might expect, according to Dominguez, cleaning is a lot more rewarding when you’re your own boss. Earlier this year, Dominguez, purchased her SBS franchise in Austin, a city she has lived in for about 16 years. We caught up with her, and here are some highlights from our conversation. Life before SBS. Dominguez used to work for a cleaning service, scrubbing down residential homes, doing this for nine years. “Sometimes the homes were very, very dirty. It could be nasty. I remember one time in the kitchen, this oven was just incredibly… oh, my God,” she says, not able to find the appropriate words to describe the state of the appliance. And during this time, Dominguez, a wife and mother of two teenagers, would think of how nice it would be to have her own business. And then one day, her sister-in-law steered her toward Stratus Building Solutions and explained how it has a low barrier of entry for franchisees with its low-cost investment and affordable financing. Earlier this year, Dominguez bought a franchise. The best thing about being a business owner. As you can imagine, Dominguez likes being her own boss – and she says the money is far better than when she was an employee working for someone else. She also likes having more time to spend with her husband, her 18-year-old son and 15-year-old daughter. The hardest thing about being a business owner. Well, she still is cleaning, and a lot of that is done at night, after hours, when businesses close. “That is a little bit hard,” she says. Someday, of course, as Dominguez collects more clients and hires employees, she’ll be able to step back, if she wants, from the actual cleaning and focus on building the business, like finding more clients and managing her staff. The advice she would give anyone thinking of buying an SBS franchise. Because Dominguez is relatively new to Stratus – less than a year – she says she doesn’t feel comfortable offering much advice. But she does say, “If somebody is asking if they should buy a Stratus franchise, for sure, I’d tell them it’s a good idea,” she says. And what’s different about cleaning businesses versus homes? While the evening work can be frustrating at times – although at least Dominguez has ample time in the day to work on her business, run errands and see her kids after school – she does appreciate that cleaning offices can be far more enjoyable than homes. Offices tend to stay cleaner than, say, a house with four children, two dogs and three cats. Still, that doesn’t mean all of her clients’ workspaces are easy to clean. “One of my clients is a daycare,” Dominguez says, chuckling. “There’s a lot of food and glue and trash all over the floor.” Fortunately, Dominguez isn’t afraid of a little hard work. Or little scraps of construction paper and glue. In her mind, it’s far better than that nasty kitchen oven…especially since she’s doing it for herself and her family. Are you interested in joining a franchise system that offers more flexibility, financial upside, and time with family? 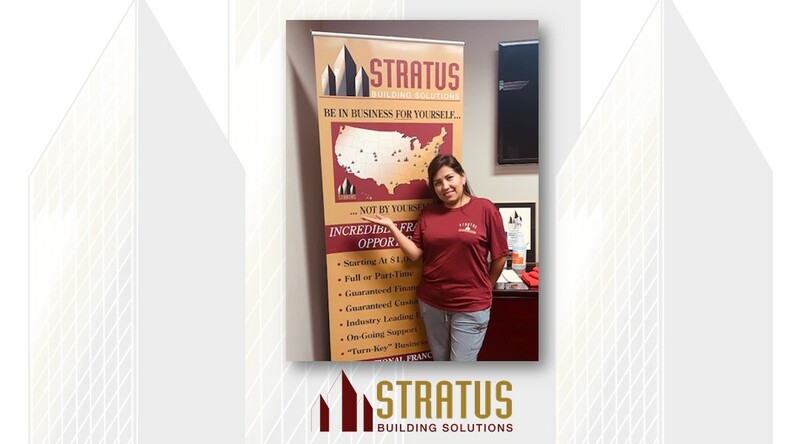 Does a unit franchise opportunity with Stratus Building Solutions sound like it could be right for you? Learn more at https://www.stratusclean.com/unit-franchise.